Yo-Kai Watch is a huge phenomenon in Japan. From its video games to its anime and even the films, everywhere you go the bright and colourful spirits are everywhere. 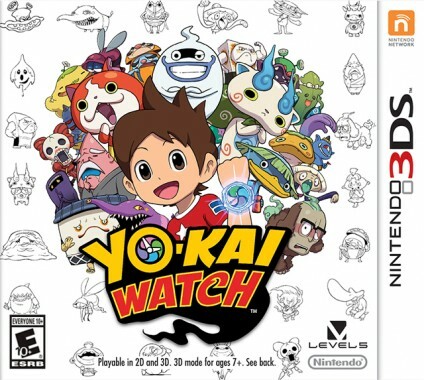 Well now the sensation has made its way to the west, and down under with Yo-Kai Watch for 3DS. 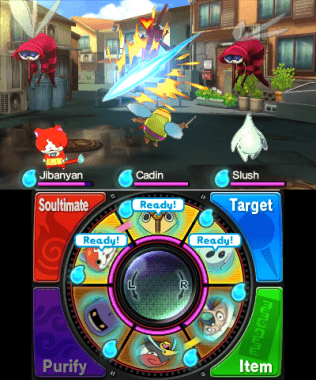 With its unique take on the “capture monsters and battle with them formula,” is Yo-Kai Watch, with its gorgeous visuals and abundance of personality destined for the same levels of success over here that it has been seeing in Japan, or does the game’s frustrating mechanics and passive combat mean that it is likely to remain relatively unheard of outside of Japan? Yo-Kai Watch revolves around these little spirits called Yo-Kai, which in Japanese folklore are responsible for various emotions we randomly feel. Things like gluttony, rage, sadness, etc are all attributed to these little spirits and in the world of Yo-Kai Watch, the player character is tasked with finding, capturing and defeating a number of these spirits that have begun to really cause some havoc. While the whole “find and catch monsters” genre is nothing new, this is such a unique and interesting take on the formula that just oozes Japanese culture in a very real way. Unfortunately there isn’t all that much to the game’s plot and what there is takes ages to really unfold. Most of the time you will just be going from place to place. Defeating nasty Yo-Kai as you go. I have to commend Level 5 on not shying away from some seriously mature and downright dark themes in this game. 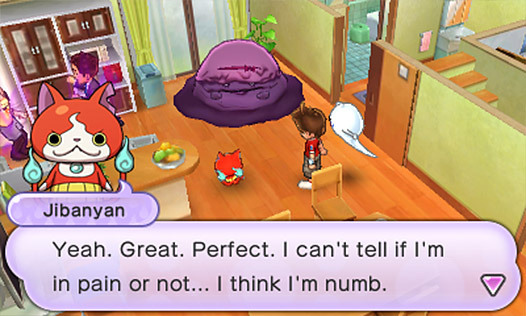 One of the first major Yo-Kai you encounter is one that is making the player character’s parents yell and scream at one another, while another I encountered was causing a character to suffer from depressive, almost suicidal thoughts. These kind of real world issues are hardly touched in video games at all, let alone ones targeted at children. I cannot explain how much I love that these issues are tackled in this game, because the more that people know and understand about mental health and that negative feelings and emotions are part of life, the more educated they will become and the better choices they will make later in life. 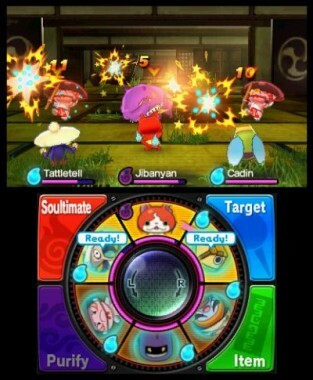 Gameplay in Yo-Kai Watch is separated into two different else,nets; exploration and combat. The exploration side of things is one of the most in-depth and engaging I have seen in an RPG of this style before, while the combat is far more passive and simplistic. At its core, Yo-Kai Watch is a game about finding, battling and capturing little monsters. To achieve that, the player needs to explore the massive world map in order to uncover the monsters themselves and do battle against them. The world map is absolutely huge and is filled with so many little secrets, hidden alleys and other nooks that it will take a HUGE chunk of your time to even make your way through it all. The titular Yo-Kai Watch is represented by a gauge on your screen that shows you how close you are to a Yo-Kai as well as its level. By investigating areas that you know to have the spirits in them, you will enter a battle with them and have the option to capture and add more to your collection. Areas that don’t have Yo-Kai in them are used to hunt for bugs, fish and various other items in order to enhance your ghostly team. These item finding sections act as a mini game of sorts, where you need to search for the bugs etc in question and then get the correct timing down in order to catch them. I personally felt that these sections dragged on for far too long, and although they are largely optional, considering how important items are to the overall game they are difficult to avoid entirely. Combat on the other hand is almost the exact opposite. Your Yo-Kai will attack the enemies in battle completely independent of you. Unlike games like Pokemon, you have very little control over the actions of the Yo-Kai and are treated more as a passive observer for the majority of battles. There are two exceptions, firstly if you want to use a Yo-Kai’s special attack then you need to perform a small mini game in the bottom screen while the fight continues without you. In addition, you can use items on your own (and the opposing) Yo-Kai in order to heal their HP. Considering the majority of the action takes place without you, being forced to only perform actions like these makes the game feel incredibly passive and like you are micromanaging the whole thing. The game is also incredibly vague and inconsistent with how you are supposed to befriend the spirits. Each spirit has its own favourite food and feeding the, it is supposed to increase the likeliness that it will want to join you at the end of the battle. However in my experience, this almost always boils down to dumb luck and random chance. There is no way to see an opposing spirit’s affection towards you so you don’t really know if you’re doing the right thing, and on more than one occasion I have had spirits that I have completely ignored want to join up with me whilst ones I focused specifically on wanted nothing to do with me. Considering this is such a vital part of the overall experience, having it come down to luck just results in frustration and irritation with the whole game. As they always seem to do, Level 5 have created an absolutely beautiful game world that is not only oozing with charisma and culture but is a joy to explore and filled with little details to take in. As you probably have expected due to the nature of the came (and the development team themselves) many of the subtle references and cultural inclusions are very Japanese-centric, almost to the point where you can learn about the country just by playing the game. Yo-Kai Watch is perhaps one of the most visually striking games that I have played on the 3DS in quite some time, and a lot of that comes down to the incredible use of colour. Everything from the lush parks, to the bustling towns and of course the Yo-Kai themselves are all so richly colourful that it is just a joy to look at. Yo-Kai Watch has become an absolute phenomenon in Japan and it is easy to see why. From the setting, to the fact that the game itself is based on Japanese folklore, all the pieces fit together to make a franchise that will no doubt dominate that country for years to come. 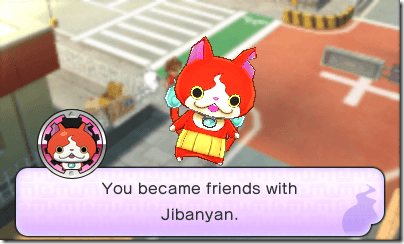 However that being said, for all its rich lore and colourful characters, Yo-Kai Watch stumbles in some key areas that will likely stop it from becoming a household name or a global sensation. In the end, the passive nature of this title makes it feel more like you spend more time watching it than you do playing and even when you are, it is micromanaging at its finest. While I enjoyed my time with Yo-Kai, I can’t say that I loved it or that it is something I would go back to in the future.